The Consortium on Financial Systems and Poverty (CFSP) is a private research organization of leading and emerging economists. Our goal is to improve the lives of the world’s poor and to reduce poverty through helping to identify, define and develop more efficient financial systems. We strive to generate tangible results that provide meaningful lessons for policymakers, researchers and stakeholders. CFSP also facilitates an important series of ongoing workshops that are designed to foster productive dialogues and scholarly progress in specific topic areas. Currently, there are three such workshops underway: Flow of Funds Accounts, Savings and the Financial Underpinnings of Macro Models, the Optimal Design of Payments Systems, and Financial System, Industrial Organization, and Economic Development. CFSP was established in 2009 by a grant to the University of Chicago from The Bill & Melinda Gates Foundation. Our research approach is directed by Robert M. Townsend in cooperation with the Executive Committee of the Consortium. Read Professor Townsend's vision statement for the work of the Consortium. CFSP adopted the following principles at our inception. They inform our approach to our work. We perform rigorous research to provide objective analysis and evaluation of financial services for the poor. We are committed to employing multiple methods to analyze the impact of access to savings and other financial services on the lives of the poor. We work to ensure that existing technical research and newly-funded research are disseminated in accessible language that can be easily understood by policymakers, practitioners, and the general public. We support research that is highly relevant to stakeholders in the realm of financial services and poverty. 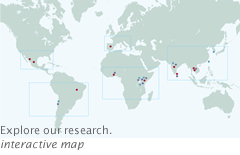 We identify and support researchers from diverse perspectives, including researchers from developing countries and young up- and-coming researchers. Request for proposal grants, which we give to researchers who have been selected in response to calls by the Consortium for research in specific topic areas. Member grants and seed grants are awarded by the CFSP Executive Committee through a private process and by invitation only. Request for proposal grants are issued in response to a call for research by the CFSP Executive Committee in a subject area that has been identified as a central topic of interest for our work. The RFP process is announced through our website, and all RFP applications must be completed as outlined. Researchers interested in applying for RFP grants are encouraged to check our website frequently or subscribe to our RSS news feed to learn when the application process has been opened.